[description] => Housemates turn angels and devils to unlock a secret locker in the Bigg Boss house. [articleBody] => The answer to the previous episode was revealed at the beginning of today's episode where it's shown that Snehan and Bindu have successfully completed their task. The task involved them to make sure lamps are lit and the fire is never extinguished throughout the night. As the day proceeds Bigg Boss introduces the popular board came, Ludo to the contestants. As the name suggests, it involves Suja and Harish who are leaders of the game to roll the huge dice, while their teammates will play step on the number board and play. In this game, the contestants lose and win points according to what's listed on the Ludo board. Snehan misses the opportunity to complete the game, as his team misinterprets the rules of the game. Suja's team consisting of Ganesh and Arav, win this challenge. But the good news for Snehan arrives when Bigg Boss announces that his previous challenge of sleeping on the floor is over, and he need not continue to do so. 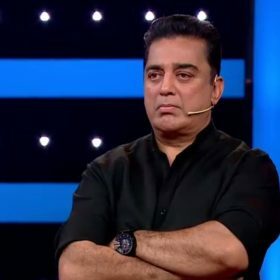 Bigg Boss also introduces another exciting game for the contestants which involves them to play the roles of devils and angels. The angels are assigned to safeguard a locker from the devils which is kept in the red room. The angels are exempted from cooking and must focus on remaining calm no matter how much the devils trouble them. Snehan, Ganesh, and Suja choose to be angels while Arav, Bindu, and Harish choose to be devils. During the game, Suja begins act child-like to Arav. A visibly annoyed Arav teases her by asking if she's pretending to act silly or she really is silly. The Devils begin their notorious activity by creating a mess in the kitchen, while the Suja cleans the mess. In this task, Bindu and Arav empty dustbins by throwing the waste on the floor. A calm and composed Suja continues to clean the entire mess in the kitchen, including the trash lying on the floor. The episode ends with the devils discussing what they can do next to anger the angels and how they can enter the red room. Housemates turn angels and devils to unlock a secret locker in the Bigg Boss house. The answer to the previous episode was revealed at the beginning of today’s episode where it’s shown that Snehan and Bindu have successfully completed their task. The task involved them to make sure lamps are lit and the fire is never extinguished throughout the night. As the day proceeds Bigg Boss introduces the popular board came, Ludo to the contestants. As the name suggests, it involves Suja and Harish who are leaders of the game to roll the huge dice, while their teammates will play step on the number board and play. In this game, the contestants lose and win points according to what’s listed on the Ludo board. Snehan misses the opportunity to complete the game, as his team misinterprets the rules of the game. Suja’s team consisting of Ganesh and Arav, win this challenge. 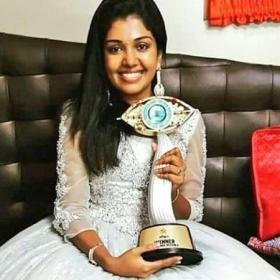 But the good news for Snehan arrives when Bigg Boss announces that his previous challenge of sleeping on the floor is over, and he need not continue to do so. Bigg Boss also introduces another exciting game for the contestants which involves them to play the roles of devils and angels. The angels are assigned to safeguard a locker from the devils which is kept in the red room. The angels are exempted from cooking and must focus on remaining calm no matter how much the devils trouble them. Snehan, Ganesh, and Suja choose to be angels while Arav, Bindu, and Harish choose to be devils. During the game, Suja begins act child-like to Arav. A visibly annoyed Arav teases her by asking if she’s pretending to act silly or she really is silly. The Devils begin their notorious activity by creating a mess in the kitchen, while the Suja cleans the mess. In this task, Bindu and Arav empty dustbins by throwing the waste on the floor. A calm and composed Suja continues to clean the entire mess in the kitchen, including the trash lying on the floor. The episode ends with the devils discussing what they can do next to anger the angels and how they can enter the red room. PLEASE viewers vote for Ganesh and Suja the TWO donkeys to be out/eliminated. They both don’t understand what’s a game. Nisha for God’s sake teach your husband some good values. Bigg boss you yourself play a fair game. We are seeing you ring the buzzer or give a comment in favour of Suja each time. That angel team is not giving any chance or gap for the other team. If the team has no Suja in it I AM SuRE you will buzz and notify. When you enter a game like this, you should not differentiate girl or boy, you have to get dirty to win. If you are not ready for the game and don’t know how to safeguard you , please stay home and watch the show. That’s for Suja! Would Snehan likes to see some women from his family getting physical as he got with suja in any of the games ? Y should they waste so much of food materials.totally disgusting. They cud hv some other way to trouble the angels.wasting atta, tomatoes oil etc. Both Snehan & Suja don’t deserve the title. They both will sure fight for the title no doubt. Either Ganesh or Arav deserve the title. Ganesh throughout no Comments. Every game he plays well and well behaved n a very good gentleman.